Note: same as referenced in: www.oztorah.com - "..The community knew Tobias Goodman as Reb Tuvya, though he had a second name, Shmu’el. 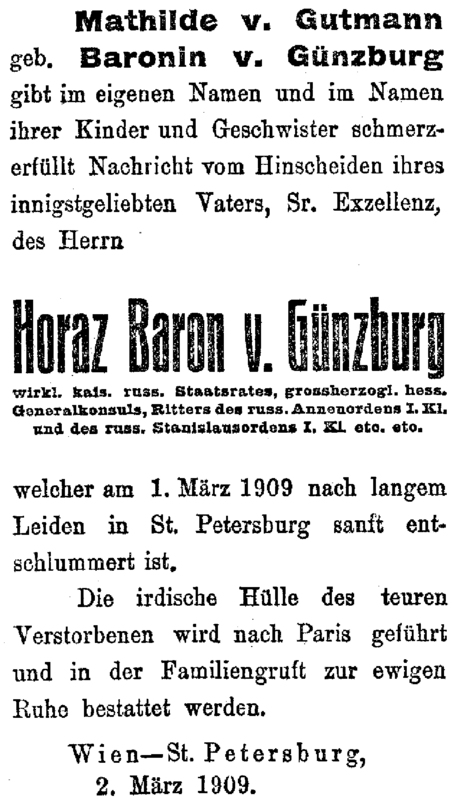 He was born in central Bohemia about 1760, the son of Rabbi Israel Gutman or Gutmann of Kolin, and died in England in the late 1830s..." ?? 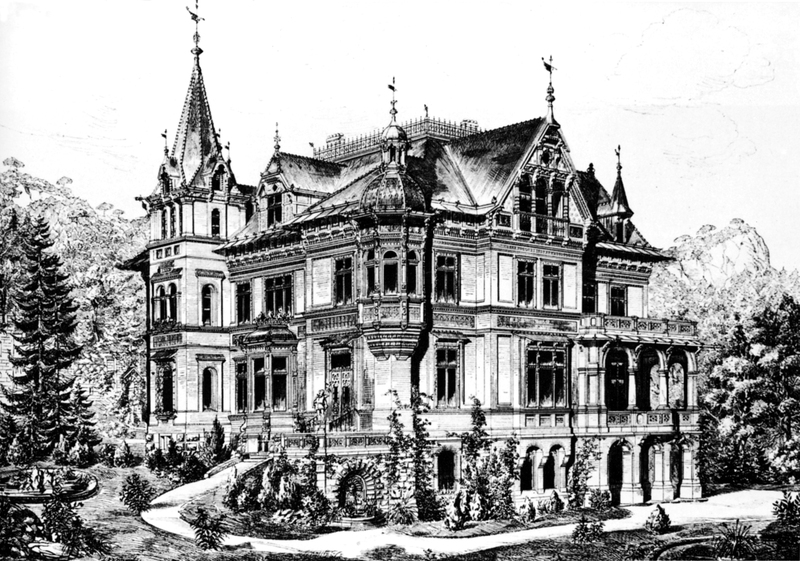 Note: JE, wikipedia ; image of 1886 Villa Gutmann, Helenenstraße-72, Baden by Vienna, ref. "Familien ritter von Gutmann und freiherr Meyer von Ketschendorf"; Wilhelm Wolf Isaak Ritter von Gutmann beginning of the 50s of the 19th Century establish a coal business firm Gebrüder Gutmann with his younger brother David ritter von Gutmann, later becoming one of the most important companies in this industry. Anselm von Rothschild joined the brothers Gutmann together to build the Vítkovice iron works near Ostrava, Moravia. Very early the value of - to put it in modern terms - human capital seem to see, particularly their social benefits for local workers employed by the construction of houses, educational institutions, as well as a kind of accident and pension insurance worth mentioning. In addition to iron and steel production, coal production and trade, the company of Gebrüder Gutmann included soon factories for sugar, alcohol, juice, soda, cellulose and fireclay production, a coach factory in Studénka (Stauding), Moravia and a mineral oil factory in Floridsdorf. In 1878, the Leipnik, Moravian-born Gutmann received the hereditary knighthood (Knight of the Order of the Iron Crown III. 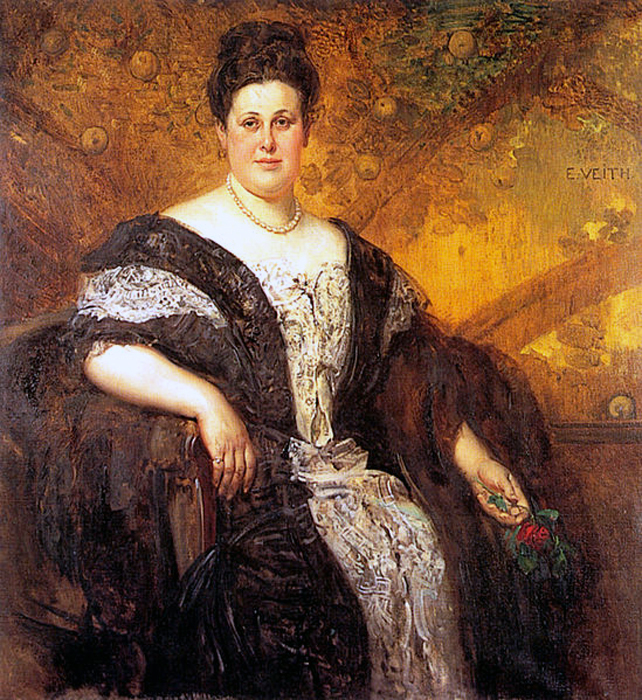 cl)..
*2nd wife of Wilhelm von Gutmann: Ida WODIANER Born: abt 1848 in Hungary? Died: May 31, 1924 in Vienna NFP Siblings: Rose-Anne Wodianer (7/8/1854 Vienna - 9/22/1937 Kallwang, Austria) & Jules (see Porges family) (5/25/1839 Vienna - 9/20/1921 Paris) diamond & mining magnate, became DeBeers co., Sophie Wodianer & (?) 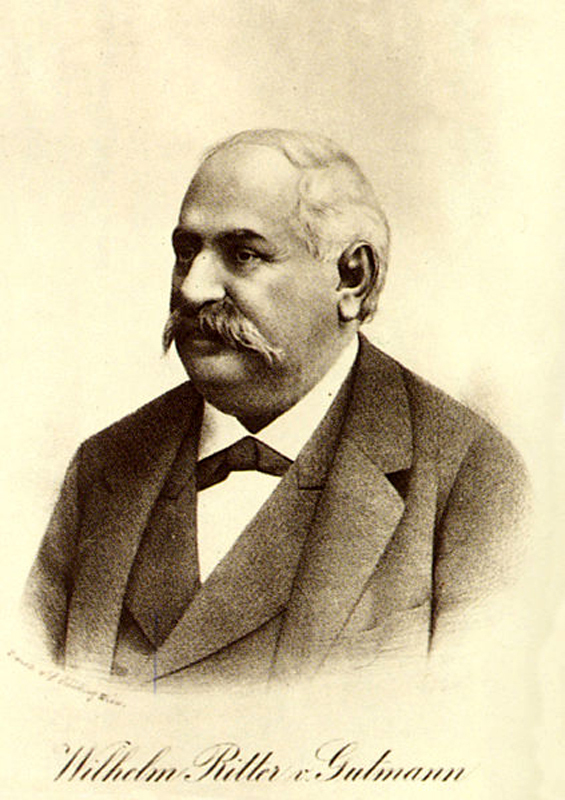 Pringsheim Father: Philipp (Fülöp) Wodianer (11/20/1820 Hódmezővásárhely, Hungary - 1/30/1899 Budapest) printer, publisher, landlord, financier in Baden wiki. Mother: Emma Porges (1827 - 1/20/1918 Vienna) NFP, *geni sister of Julius Porges ?her son-in-law? Note: Neimeyer & page2 - on Rudolf ritter von Gutmann, Vienna, Book; My Hunting Expedition in the Year 1909 "Seattle/Vancouver - Alaska - Chukchi Peninsula - Kamchatka, author’s edition printed as manuscript 1912, 2 unpag. leaves title + dedication, 30 pp. with route map + 87 heliogravures on mounted China of varying size as dedicated plate each from the author’s on-the-spot photographs.. With a company of five Baron Gutmann left Europe June 15, 1909, on the Lloyd steamer Kaiser Wilhelm II to reach, after short stays in New York, Chicago and the Yellowstone Park, Seattle on July 6 and by this the Norwegian steamer “Transit” chartered for the purpose of the hunting expedition.. - maritime experience serving your maritime collectionjan Hendrik Niemeyer art trader since 1992"
Note: ref. 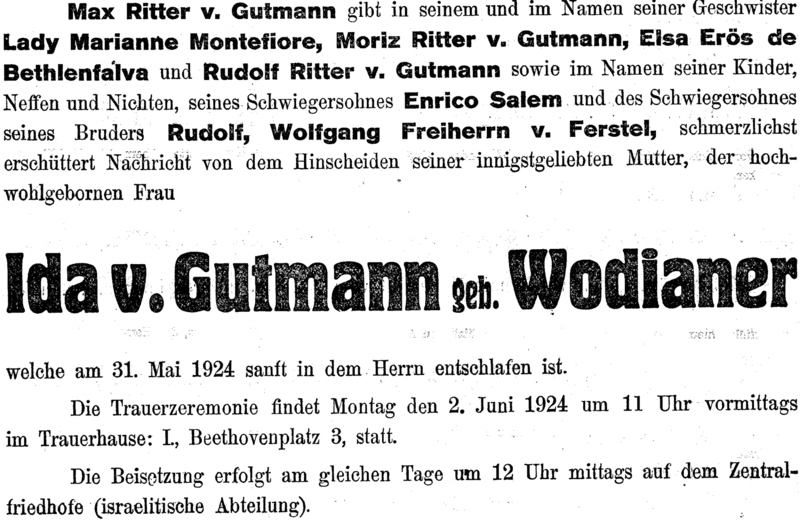 Kramerius (in German): Jan 2, 1889 dr. Ludwig ritter von Guttmann (in Neu Witkowitz =Vitkovice?) with baroness Günzburg.., 2nd ref..
*2nd wife of Otto Krause: Charlotte "Lotte" LEHMANN Born: Feb 27, 1888 in Perleberg, Germany. occupation: Opera Singer. Died: Aug 26, 1976 in Santa Barbara, California interred in Vienna cental cem. Note: wikipedia; Charlotte, a German Soprano who was especially associated with German repertory. She gave memorable performances in the operas of Richard (see Strauss family. 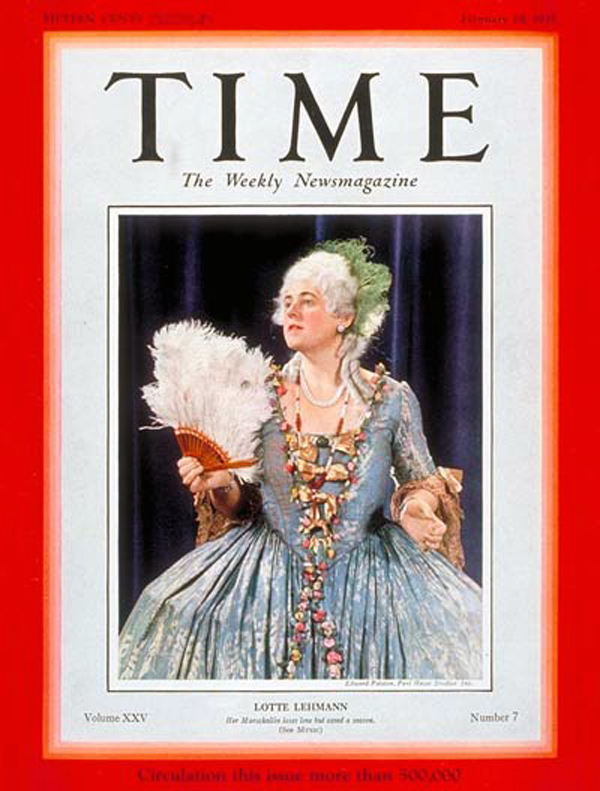 The Marschallin in Der Rosenkavalier was considered her greatest role. 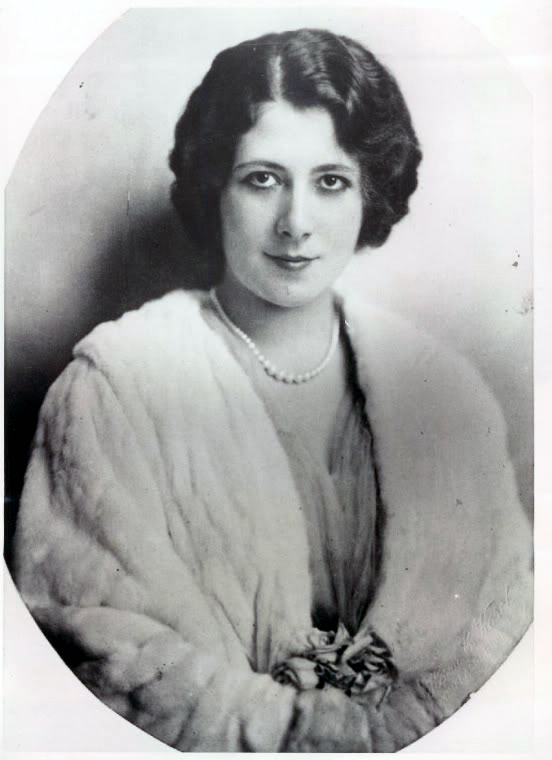 During her long career, Lehmann also made more than 500 recordings.. Just before Germany annexed Austria in 1938, Lehmann emigrated to USA, where she sang at the San Francisco Opera and the Metropolitan Opera until 1945.. For her contribution to the recording industry, Lehmann has a star on the Hollywood Walk of Fame at 1735 Vine St. However, her first name is misspelled there as Lottie."